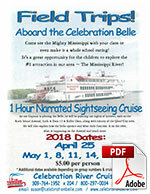 Introduce your students to the Mississippi River by taking them on a cruise aboard the Celebration Belle, the largest riverboat on the Upper Mississippi River. A Mississippi River Cruise can be tied into nearly any subject your classroom is studying; from literature, history, social studies, to math, science and art and photography! As our Captain is piloting the Belle, he will be pointing our sight of interest, such as the Rock Island Arsenal, Lock & Dam 15 & Roller Dam, and the history of the Quad City area. He will also explain how the locks operate and what their function is on the river, what is happening on the Arsenal and much more. 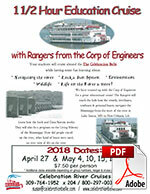 We have teamed up with the Rangers from the Corps of Engineers for a really great educational cruise. The Rangers will teach the kids how the vessels, riverboats, towboats and personal boats, navigate the Mississippi from the start of the river in Lake Itasca, MN to New Orleans, LA. And how the Lock and Dam System works. They will also do a program on the Living History of the Mississippi. How did people travel on the river, what kind of boats were used, an over view of life on the river. Looking for a unique and safe way to celebrate a high school event? Come aboard the Celebration Belle for a Prom, After Prom or Graduation that the kids won’t forget! Your event can be as formal or as informal as you want. We can do a sit-down dinner or a dance cruise; breakfast at 1am or pizza. The Belle promotes a drug free / alcohol free event and kids will not be able to leave until the event is over. Let us help you create memories of a life time! The Celebration Belle can host your Event, be it the Spring Fling, formals, dances, we can accommodate up to 700 people. Call our Group Department at (800) 297-0034 x 4 for more information.